My Love List :: What’s Yours? Special thanks to MeganJane for sharing she likes purple’s blog post & love list challenge. With that, I’ll start. I love an inspiring challenge. I love the sound of rain tap-a-tap-tapping on an old tin roof and watching lightning storms seemingly dance over the ocean. I love the way light looks bouncing off my beaded garland on a sunny afternoon through my little kitchen window. I love simple, guilty pleasures to indulge my senses in. I love Starbucks iced venti skim mocha’s; especially sitting outside on a perfect spring day where that almost perfect light breeze is brushing your cheeks. I love the smell of autumn winds and the sounds of leaves rustling while the trees whisper. I love custom gift wrapping in pretty colored boxes adorned with exquisite ribbons and perhaps even rustic branches tied on with twine. I love the smell of bookstores and the rush i get every time i walk into one. I love paging through old letters and diaries of people I never knew and imagining what their life must have been like. I love being connected with all that came before me. I love organizing, and making piles of trash bags to be wistfully carried away. I love finding that amazingly perfect conversation with someone you never expected outside at 2 am and staying up til dawn without ever realizing it. I love sunrises. I love life’s little luxuries; breakfast in bed with cute pajamas on high-thread count, crisp and oh-so-cool white sheets. I love soft, cozy, squishy pillows that i can scrunch up and snuggle against; bonus points if they are cool. I love the sound of birds singing filling the air, and the way my cats crank their adorable little heads to watch. I love losing myself in a striking sunset and the joyous reminder that the world is filled with everyday beauty. I love old chandeliers with pretty prisms. I love hanging ornaments on a tree. I love google. I love kitchenware; platters and pitchers and pottery that tells stories. I love using my grandmothers beat up old pots & worn down casserole dishes relishing the knowledge that her hands once were upon them as well. I love pausing for a moment, just to breathe that memory in. I love the original creaking, old, knicked-up hardwood floors in houses that are a century old and just begging to have their stories told. I love main streets and small towns almost as much as I love countrysides. I really do love dancing about when noone’s watching and fresh cut flowers strewn about the house. I love long, drawn-out and dramatic monologue’s and cheesy i-will-die-without-you-love speeches in movies. I love getting a french manicure and putting on a plush bright white robe after a shower. I love giggling when people fall. I love writing letters with a micro-tipped black ink pen on elegant stationery. I love envelopes sealed with a pretty sticker or better yet a wax seal. I love bakers twine wrapped around a stack of tattered old love letters with a strand just plaeading to be pulled. I love walking into paper source and touching every sheet of lush paper as I walk by it. I love pretty fabrics just begging to have my hands run over them. I ab-so-friggin-lutly love the genuine smile of a child at the precise moment you needed it or the kiss of a dog when you least expect it. I love serendipity. I love having the insides of my closets painted in pretty colors, and the suprise you get each time a door is opened. 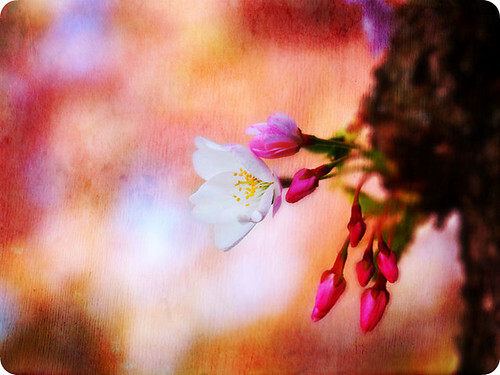 I love softly colored nature photos with smooth and silky bokeh. I love the smell of woodsy bonfires and the memories that rush back right along with it. I love going to Mt. Washington and peering over the city I was raised in. I love sitting amidst a crowd unnoticed and watching people pass by, observing them when they don’t necessarily know they are being watched. I love receiving a shipment of sharpies or caran d’ache watercolor crayons or faber-castell artist pens when every imaginable, glorious color is included. I love journals: small journals, big journals, journals covered in fabric, journals with pretty tassels, journals made by hand or laminated with eye-catching art. I love simple little moleskine journals, and elaborate journals with highly textured handmade paper. I love all the unclaimed dreams lying between each page. I love an iced-cold new castle beer on a sweltering hot summer day and a fresh white v-neck tee shirt paired with a pair of crisp new faded blue-jeans. I love possibility. I love the never-ending plethora of options we have in life. I love the way words dance and I love talking in silly, nonsensical accents…just because. I love laughing; not just a simple giggle or a slight chuckle.. but that from-the-gut super deep in-the-pit-of-your-belly laugh that often leaves you with tears running down your cheeks when you’re done. I love that life makes us smile, even when it breaks your heart. I love living, even when it’s not easy.. especially when it’s hard and delighting in the day it was all worth it. At the end of the day, I love being me and all the fateful flaws, hopeless optimism, oddities and eccentricities that entails. I love singing at the top of my lungs and not caring if it’s on key and the surprise that I was ‘caught’. I love sarcasm, horridly bad puns and so-stupid-they are funny one-liner jokes. I love remembering all the things i hold dear, and truly love. That… my friends, is my little list — for today anyway. I think i may just do this once a week, cuz’ boy oh boy did it make my day much lighter. I sense this coming on as a new theme for an art journal. Now kiddos, let’s see your “love list”. Be sure to leave me a link to yours! Chrysti, this is SO wonderful. I’m so glad you did one! This rocks, I love it. Thanks for your comment! I popped over here to read yours too, after seeing your comment on she loves purple! I love your list! The idea of doing it once a week is a great one. This is really beautiful/inspiring! Very well done. I love your list. Thanks for stopping by my blog. I love your list! It makes me wish I would give up my efficiency and go for languid expressions of detail, they really are so beautiful. Thank you for commenting on mine so I would come find yours! You have a wonderful list! You can read mine now. I love your list too! I found myself nodding in agreement with most of it. You are an absolute inspiration. When I’m feeling irritable or down, I just have to think of your lovely philosophy and it brightens my day. Thank you. I just read your Love List and can not tell you how wonderful that was to read! This is a for sure on my list for journaling tonight. This is why I enjoy getting my daily dose of your blog. Beautiful! And a challenge! Ok..my next post on sodistressing will be my love list! Thank you for sharing! That was the best love list I’ve ever read! Really. It made me love my life all over again, and then some. Thank you!